A couple weeks ago, we talked about the infrastructure that we need to put in place before we can release our upcoming Alpha, and that’s still our primary focus. This isn’t exactly the most fun part of game development to hear about, but we thought it’d be best to tell you about our upcoming development schedule and what that looks like for you. In fact, what this’ll all soon look like for you is already laid out in the above image! This is our first-draft of the main menu (already, it’s out of date), and functionally, this will be your gateway into the Alpha. Pretty simple, right? Well, as with anything in game development, it is never as simple as it looks. Next week we aim to start testing the login process — making sure client to server communication through the Google API actually works and works reliably. We want you to be able to login, obviously, but we also want to make sure the key authentication functions properly and isn’t just letting everyone through. We want as many eyes on our game as possible, but alpha testing can get messy if we don’t keep it under control! So, we’ll be adding testers in waves, growing the pool steadily. It’s like a private club, except not as many people think you’re cool just because you got in. After testing and ironing out any problems with user and key authentication, we will be designing systems to help us collect player behavior data. “How far are they driving?” “How long did they play?” “How many resources are they collecting?” I’m sure our development team has more information they’re hoping to gather, but it’ll all follow along the same lines as those questions. Then, of course, we want to make sure our server actually hangs onto this data for us! And, finally, we will be looking at how frequently the game sends those data updates to the server. All of this means another round of internal testing to make certain our data collection and recording systems are working as intended. Then, we should ready for the next stage, provided we didn’t leave anything out … If there’s one thing we’ve learned about game development since the start of this project, it’s that there is always some crucial step you don’t fully anticipate. 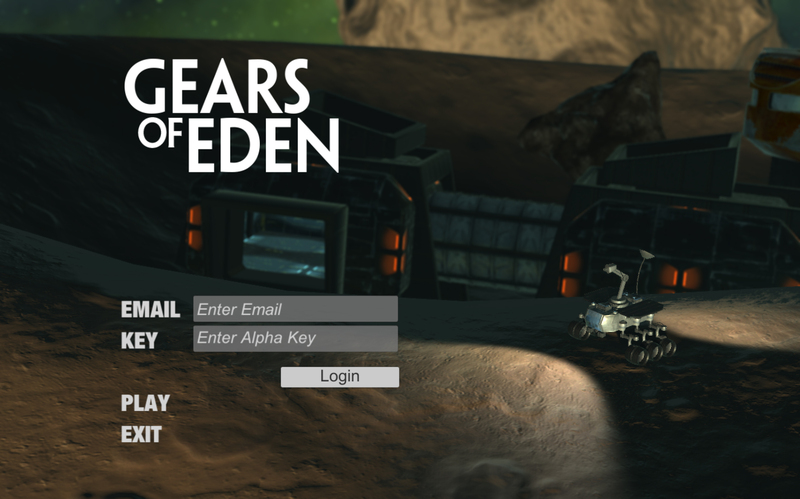 Fortunately, development woes and development triumphs are always fun to read about, so be sure to give us a follow on Twitter and Facebook to get the latest and greatest on all things Gears of Eden! We’ve decided to push our Facebook a bit more, so you can expect to see some exclusive art and screenshots there! There’s also still time to get into Alpha if you’re interested! By signing up for the newsletter, you not only make our day, but you also get entered into the drawing for an alpha key! There’s even the option of buying an Alpha Key at our donations page, which is always mind-blowing for us. Whether or not you do though, thank you so much for sticking with us through this journey, we’ll back back next week with even more on Gears of Eden.